That reminds me, though. Who's the girl in-between Aselia and Shukumei Myuugi? It's been bugging me for nearly two weeks. I have this feeling I've seen her from somewhere...one of the setting books or from a tweet. Glad to see I was right about Shun being the last mystery character. I thought I recognized him on the splash art, but it's hard to tell with just a face and a whole new art style. Between Aselia and Myuugi is Radiance Amphanse...the name sounds familiar, but I can't say I remember anything about her lol. Shun is largely relevant to the overarching story, so it's a good thing he's included. After all, he has a contract with Setsuna. Radiance Amphanse? Wow, I had a feeling it was a cosmic balancer. So that's what she looks like. She's the wielder of Chouritsu, or was. I only know that she gave Unmei to Rogas before she confronted wielder of Eigou who was about to annihilate everything. I thought it was Narukana lol....On the left of Aselia right? Left of Aselia is Narukana, yes. Right of Aselia is Radiance. She's the wielder of Chouritsu, or was. Ahh, yeah now I remember. Searching through ALL the books I finally found her spot (also I guess her name is Amphonse, I misread it because of the overlapping cards). Interesting that she's just listed there as "something above an Eternal." Old news I guess, but I wonder what that says about Euphie? Newcomer to the series here. Is 永遠のアセリア worth playing? I've heard a number of stuff got retconned once Takase took over this series' writing? Last edited by trexalfa; 2018-07-19 at 11:52. If you like orthodox JRPG, it'd most likely be worth playing. So looks like they've opened a new web-shop for their stuff (https://swords.booth.pm/). They've got a bunch of the new C94 stuff in the shop already. Unfortunately, it seems like the Card Game is not one of those, and I've had no luck finding a copy of it online. Fingers crossed that there will be a second printing I guess? 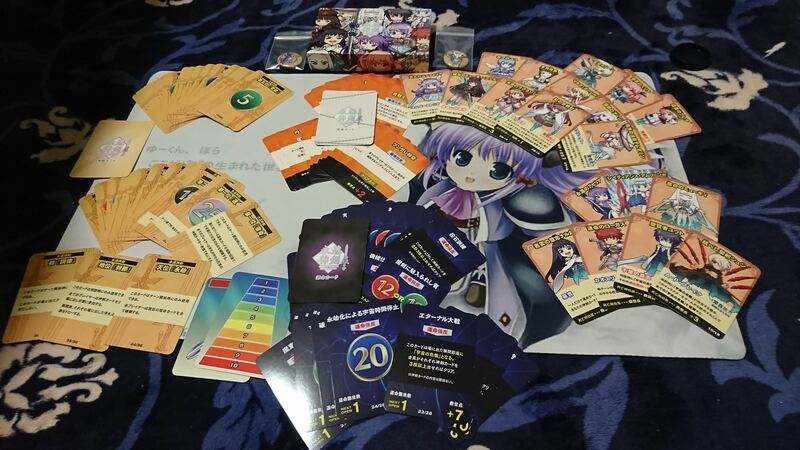 I still can't find the card game anywhere. At least no one willing to sell it. I really hope they'll do a retail sell of it. Got Song Collection 6 today. The drama CD is short this time, but it essentially an epilogue to the story that transpired on the world of Agasutia. Sadly, a bit more than half the cast is absent so I hope there'll be another CD to follow their respective perspectives next. As usual, message me if you want a copy. It's been awhile, huh. So 2019 is supposed to be a big year for Euphoria who should be the heroine of the next main title, and also for the series in general. Naofumi acknowledged that story content have been stagnant, and so he's focusing on writing original stories and world-building to get the whole story moving forward to the next step this year. That aside, this thing about Naofumi wanting to try a 3D dungeon RPG has me worried unless the 3D is comparable to HI3. A relationship chart just came out. Not guaranteeing accuracy aside from names taken from High Resolution book and there are some that I couldn't translate, but I did my best. Corrections are welcomed. 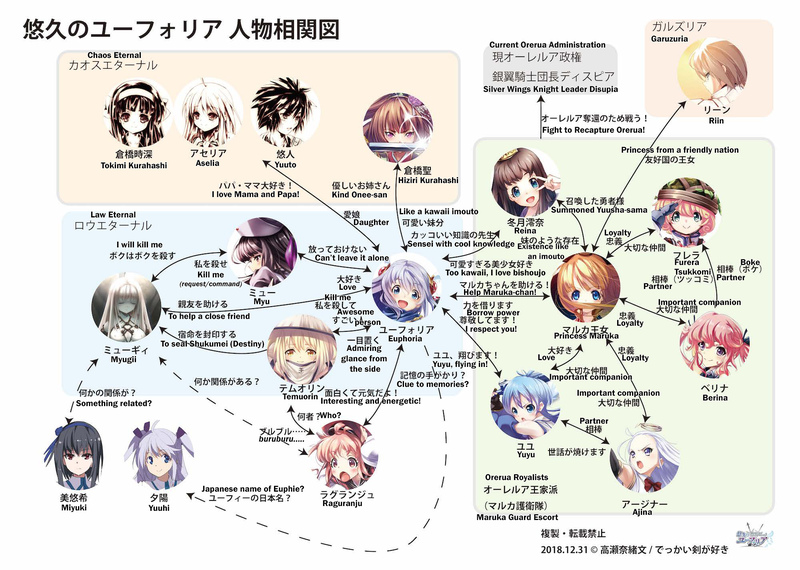 Huh....the character relationships involved have become much more simplified for this arc. That's actually not a bad thing if they are going to progress the story bit by bit. But WTF, Euphoria knows Myugi and can actually get along with Temuorin? What is she? Nanoha? Another Law Eternal to join the party, one who isn't laid-back and just going with the flow to contrast Temuorin would make things a less simple and more interesting. As for progress, I'll be happy with at least considerable development on the Eternal War front. These small-scale stories with sentimental and anecdotal touches are nice, but it's about due time for the larger pieces to come together to form the overarching climax already. I don't think Euphie knows Myugii, not personally. She befriended her through dreams as the flavor text in Seinarukana revealed. Ah, either Temuorin is really good at hiding it, or really don't have a clue about Euphie's secret. She has her suspicions though. Plus, with the way she drops hints like how actors have gathered, it feels like just another keikaku doori for her even if she doesn't know. Maybe it's 'cause Temuorin wasn't fleshed out in the first game, but I'm really loving her character being written in grey shade rather than just good vs evil/black vs white. She's still a Law Eternal, but she's not above lending a hand and playing the role of the good guys and just having fun in the meantime as long as it's all according to plan of course. Blue, white, red, zenryoku zenkai-like optimism and a fated ability to befriend all? Maybe more likely than one would think. Where's Miyuki and Yuuhi from? Eh, Law Eternal doesn't automatically mean "bad" actually. It's just that in Aselia, Temuorin was pretty flat out malicious. It's only with the release of post-Seinarukana data books and stuff that the whole Tokimi vs Temuorin conflict was fleshed out and Temuorin became much more grey.